We have combined two of our most popular units into one! A combo combines numerous activities into one: bounce, climb, slide, and basketball. Justice League is our most popular theme! 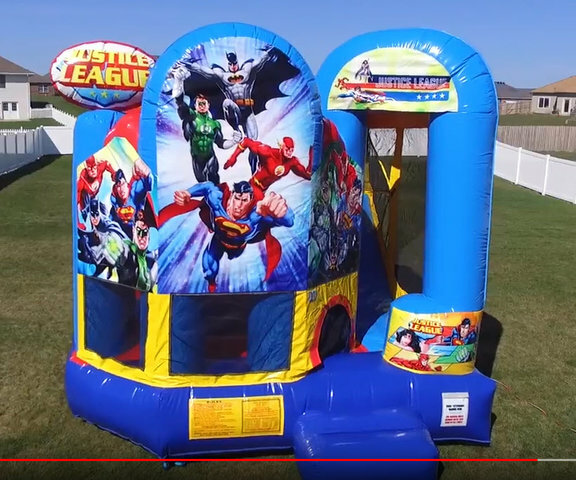 This Justice League bounce house combo is the perfect for aspiring superheroes, allowing plenty of room to practice those superhero moves. The Justice League characters are ready to welcome visitors with smiles from the Green Lantern Superman, Batman, Flash and Wonder Woman. This adventuresome unit includes a pair of three-dimensional "Justice League" logos, letting visitors know the location of this fun-filled jump. To see a video of this click here and here.